Kota Kinabalu sits on Sabah state's west coast, toe to toe with the South China Sea. It's no surprise, then, that seafood occupies a prominent position in the city's economic and culinary landscapes. Right in the center of town fishing boats unload their catch behind a building housing a seafood processing facility. 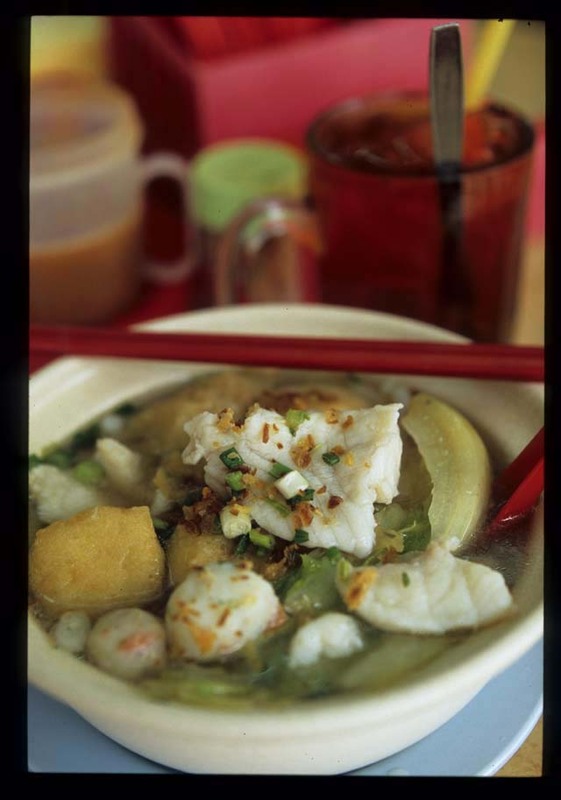 Seafood restaurants line Jalan Tun Fuad Stephens, KK's main oceanside thoroughfare, and are scattered about its smaller streets. And stalls serving up tasty fish, griddle-grilled on banana leaves, are a fixture at many of the city's coffeeshops. 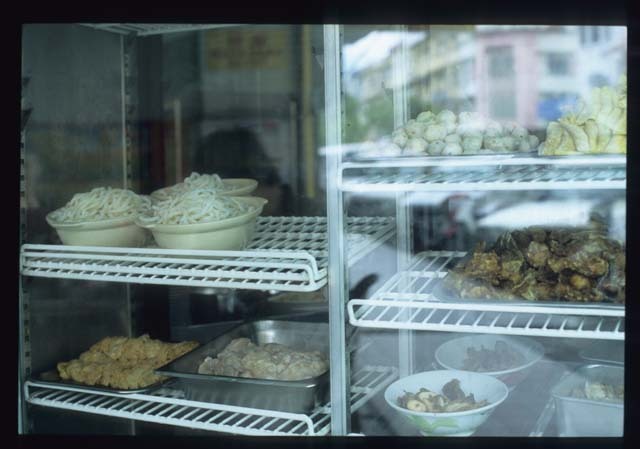 For a small place on Jalan Pantai fish, in the form of noodles, is big business. I'm not referring to noodles with fish, but noodles made of fish. Every morning Yuan Li's owners transform ikan parang (wolf herring) into mee ikan (fish noodles) - thick, round strands with a whisper of piscene flavor but not a trace of fishy stink. While they're at it, they also turn out tender, carrot nub-studded fish balls that hold their shape without being too springy. 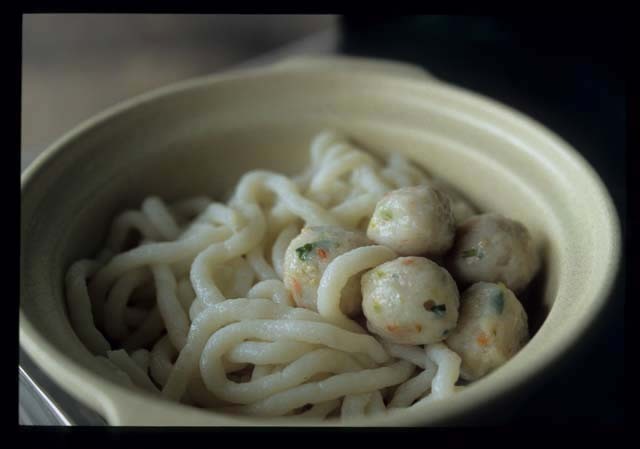 Take a bowl of expertly crafted fish noodles and balls (opening photo) and add tofu puffs, fish paste-stuffed fried tofu, thick slices of a mild, snow-white, grouper-like fish, a few leaves of head lettuce (for texture), scallions and, if you wish (I didn't), deep-fried bone-in fish, rich egg dough dumplings filled with pork, and chunks of tomato. Then float it all in clear, bright-tasting chicken stock. This is what you end up with: a bowl brimming with yumminess (the kind of noodle-y yumminess that even a carbo-phobe could guiltlessly dig into, by the way). It's a heaping serving of soup noodles so scrumptious that even a soup noodle naysayer such as myself (in this climate, I don't need the extra heat), after slurping her way to the bottom, couldn't stop thinking about it for the next 67 hours, to the extent that I made darn sure to set aside enough time on the morning of our departure from KK to sprint back to Yuan Li for one last fix. And there's more. Yuan Li makes a fine, not-too-coconut-cream-rich curry served with laksa or - way better - those ambrosial mee ikan. This bowlful substitutes bean sprouts for head lettuce and thin, aromatic curry for chicken broth; otherwise its a mirror image of mee ikan soup. 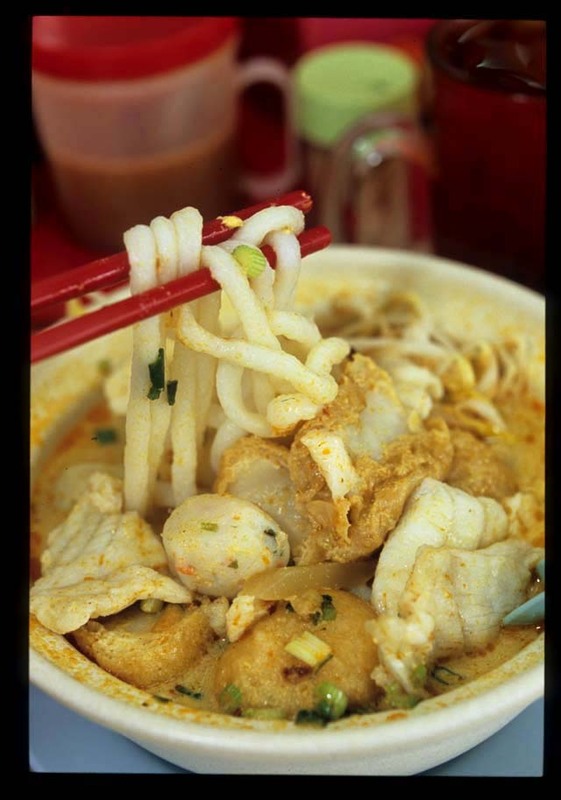 Yuan Li's fish noodles are a curry's match made in heaven; their slightly rough texture catches dribs and drabs (coconut milk, spices, wayward flakes of fish, the odd scallion or two) and holds them in place en route to mouth. A second bowl would surely have elbowed its way onto our agenda, had we been in town just one more day. 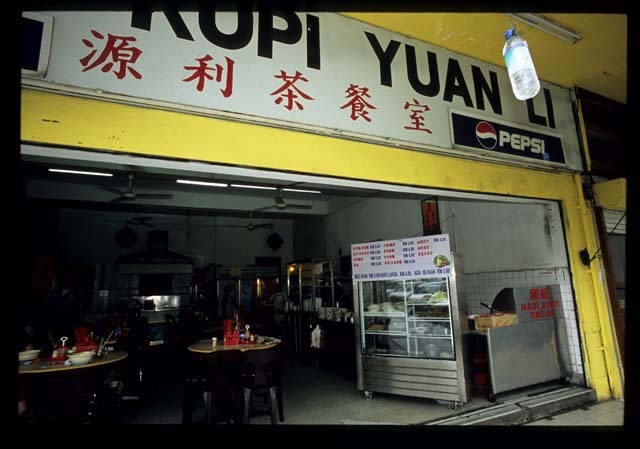 Kedai Kopi Yuan Li, Lot 28, Jalan Pantai, Kota Kinabalu. 6am-3:30pm. Closed Mondays. Oh, you're killing me!! I'm with Robyn (above), I want fish noods now! paired with a glass of icy cold kalamansi juice with salty preserved plums. DROOL. that's one of my absolute favourite foods growing up! it's weird how i've never encountered it anywhere else in Malaysia. Folks, I do have to say that those fish noodles are seriously, deadly delicious. Would have to go in my 'Malaysia's Top Five Noodles'. This post is making *me* hungry. Coincidentally, we happened upon a package of fish noodles in the tofu section of the grocery store, the afternoon we got back from KK. But I'm not gonna go there. I can't imagine mass-produced pre-packaged fish noods come anywhere close to these babies. KG - check back later in the wk for more KK treats. I'm envious you're headed there next wk! the fish noodle is absolutely darn goood..........its heavenly fish noodle paired up wit its long hours of brothed soup was jus excellently great..............a definitely die die must try!!!!!! !